The Exxon-Mobil LNG project promised to transform Papua New Guinea into a middle income country, but those promises ultimately proved to be false. Now Chinese owned PanAust is making similar claims for the Frieda river mine. The US$8 billion (K26.5 billion) Sepik Development Project at Frieda River will create ‘a new economic corridor’ in one of PNG’s northwest. Developer PanAust is suggesting it could give employment to about 5000 people during construction and increase Papua New Guinea’s GDP by K90 billion over 40 years. The Frieda River gold deposit in West Sepik (Sandaun) Province is one of the world’s largest and has been under the control of Frieda River Limited, a subsidiary of PanAust, since 2013. Chinese-owned PanAust holds an 80 per cent interest in the project. Establishing a gold and copper mine was always going to be a daunting prospect, given the area’s remoteness and lack of infrastructure, which is why PanAust recently announced a major shift in its plans for the project. Its proposed solution is to turn it into a large scale development project that involves much more than mining. The aim is also to establish a hydroelectric power facility with a generation capacity of up to 490 megawatts of renewable energy to supply both the mine and external customers. 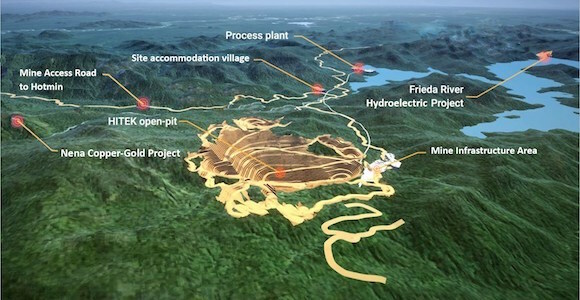 ‘It will be PNG’s largest single power generation facility and could operate for more than 100 years—well beyond the mine life of the project,’ Peter Trout, then-Executive General Manager Technical Support and Studies for PanAust, told a mining event late last year. The installation of a regional power transmission line from the hydroelectric facility is also planned, which could potentially supply Indonesia. construction of a further 221km road from Green River to Telefomin, including a 350-metre bridge over the Sepik River. This will enable access to the mine site and the hydropower station. The cost of this critical enabling infrastructure is estimated to be US$500 million (K1.7 billion) and PanAust expects it to be funded by third parties and shared with other users in the region. Peter Trout described it as a ‘complex undertaking by virtue of the various dependencies’. Trout said the expanded project will create ‘a new economic corridor’ in the region adjacent to PNG’s border with Indonesia. The project will require an estimated initial capital investment of US$8 billion (K26.5 billion). That would make it the second largest investment in Papua New Guinea after the PNG LNG project. There is a projected mine life of 33 years (revised up in 2018 from 17 years), and a pathway to extend this to 45 years, with average annual production rates of 170,000 tonnes of copper and 230,000 ounces of gold. Trout said the proposed 45-year mine life ‘takes advantage of the facilities that have been established for the initial mine development’. The project is structured to attract funding from equity investors, financiers and export credit agencies, according to PanAust. 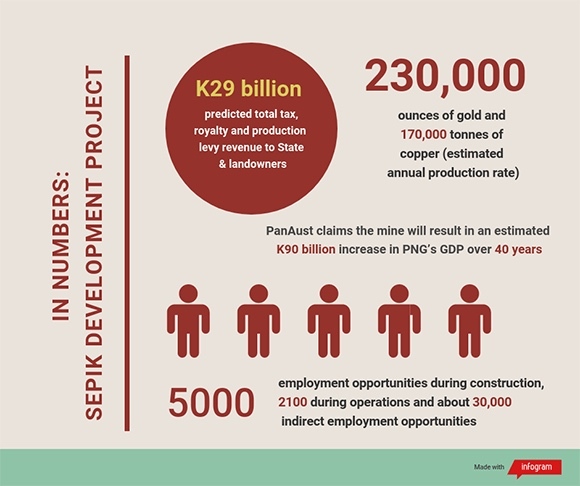 PanAust claims the mine will result in an estimated K90 billion increase in Papua New Guinea’s GDP over 40 years. It estimates total tax, royalty and production levy revenue to the State and landowners at K29 billion. The change in the project’s scope has already seen some major changes to senior management at PanAust, including the departure of Managing Director Fred Hess, Chief Financial Officer Andrew Price and Peter Trout himself. PanAust’s minority partner in the project looks also set to depart. The remaining 20 per cent stake in Frieda River is held by Highlands Pacific, recently acquired by Canada’s Cobalt 27. Cobalt 27 has flagged that it will be making its ‘best endeavours’ to enter into a buy-back agreement with PanAust, would allow PanAust become Frieda River’s 100% owner.